The Kobayashi Pharmaceutical Group's commitment to CSR is embodied in its management philosophy of "providing people and society with comfort" and constantly delivering its “You Make a Wish and We Make it Happen” philosophy to customers. At the same time, we are aspiring to be a group of companies that constantly earns the trust of its stakeholders by reducing its environmental impacts and engaging in social contribution activities. The Kobayashi Pharmaceutical Group believes the most important aspect of product development is to ensure safe and secure quality. Under the belief that quality is the life of the company, we established the Quality Assurance Department in June 2010 as an organization directly headed by the President in order to strengthen our quality assurance framework. In November 2011, we drew up the Quality Assurance Policy to establish a guideline on quality that all employees must adhere to in their provision of products and services. In addition, to ensure compliance with the above, we have established Quality Assurance Management Rules and Quality Assurance Implementation Rules to clearly define the responsibilities and authority of each office and position. Each and every one of our employees closely abide by these rules to ensure quality improvements are consistently made across the entire value chain, from product development and manufacturing to sales. We are also committed to not only the quality of products, but also the quality of product development whereby customer needs are met in every phase of the life cycle, from development to purchase, use and disposal. Our product development people constantly debate whether product directions are easily understood, do products offer a universal design easily handled safely by any consumer, are container designs easily sortable and disposable, and does our packaging help to reduce waste, to ensure even greater quality is achieved. Our goal is to achieve further quality improvements from a customer-centric standpoint and to build a corporate culture with zero tolerance for leniency in terms of quality. After releasing a product, customer inquiries and suggestions are received and compiled at our customer service center. As customer inquiries and suggestions have grown more complex and advanced in recent years, we have developed a system in which our customer service representatives call our customers back in order to spend more time discussing their feedback and concerns. Our response to customer feedback overlaps with the emotions of each individual customer. This is because true understanding is made possible only after recognizing each individual situation and emotion rather than simply understanding the usage scenario, which in turn greatly improves our services and product quality. Customer inquiries and suggestions are also forwarded to our development and manufacturing divisions, where they are reflected in product improvements and new product development. During trial production of an improved product, we carefully verify if customer expectations are met. Furthermore, after the improved product is released, we continually analyze customer feedback to ascertain whether the improvement was adequate or whether additional modifications are necessary. The Kobayashi Pharmaceutical Group is committed to reducing waste and promoting recycling to cut down on waste generated from customers and the waste emitted from the Group. We are directing efforts toward the reduction of environmental impacts caused by containers and packaging since our stakeholders are becoming more conscious of the environment. The Kobayashi Pharmaceutical Group is actively promoting the 3Rs (reduce, reuse, recycle) through the use of recycled materials and the development of container and packaging solutions that provide product information at the time of use as well as protect the product during shipment by using the minimum materials. The refill container for toilet bowl cleaner Bluelet Okudake now features a thickness of just 0.3mm in the cup portion, making it the thinnest plastic container in the world made by mold injection*. This container received an award under the toiletry category at the Japan Packaging Contest 2012 hosted by Japan Packaging Institute. In addition, it received the AsiaStar Award at the AsiaStar 2012 Contest, an international packaging contest held in Asia by the Asian Packaging Federation. In addition to the thinness, which contributes to cutting down environmental impacts, the container was recognized for its easy grip and easy open design. * Method of molding where melted plastics is poured into a mold. Environmentally friendly, easy to open container for the refill. For the fiscal year under review, recycling volume totaled 3,161 tons, or 75.3% compared to the previous fiscal year, representing a 1,039-ton year-on-year decrease. This represents a recycling rate of 99.9%, marking the fourth consecutive year in which we achieved our goal of zero waste emissions. 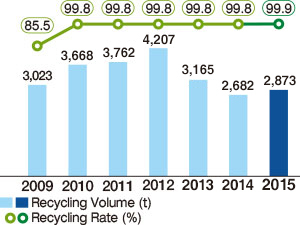 The reduced recycling volume is due to gradually improving results of our waste emission reduction efforts. Going forward, we aim to increase our rate of material recycling, which involves collection of waste materials generated from used products or production processes, for reuse in raw materials or ingredients for new products. The Kobayashi Pharmaceutical Group is committed to cutting CO2 emissions from the stage of product development to distribution. 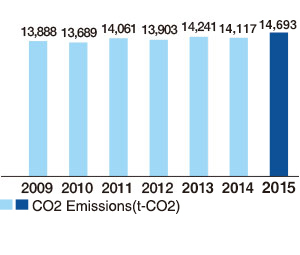 CO2 emissions in all manufacturing divisions in fiscal 2015 increased 576 tons (+4.1%) from the previous fiscal year. But, CO2 emission per one ton of production weight was no change compared to the previous fiscal year. We are going to reduce CO2 emissions by working the efficient production, eliminating the waste of production process, and introducing the equipment for saving energy. In order to reduce CO2 emissions from the operation of sales vehicles, all sales divisions have adopted eco drive mode with the aim of improving fuel efficiency by 5% compared to the previous fiscal year. In August 2014, all 341 sales vehicles have been replaced with hybrid cars, except for the four wheel drive vehicles used in cold regions. Through this change, we anticipate to reduce CO2 emissions by approximately 313 tons a year, which is equivalent to the amount of CO2 absorbed by 22,357 Japanese cedar trees. Copyright(c) 2013 Kobayashi Pharmaceutical Co., Ltd.